Military, police, firemen, and miners work in unusually perilous conditions - these are environments where the available oxygen can quickly become dangerous to breathe. 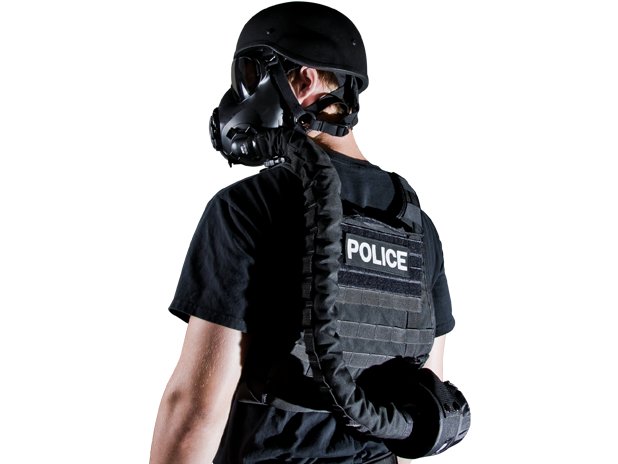 Humanfactors developed a series of PAPR concepts (powered air purifying respirators) for Avon Protection Systems that would provide seamlessly integrated auxiliary breathing for first responders. Drawing attention away from a first responder’s immediate duties can be life-threatening - it was imperative that Humanfactors not only integrate the PAPR system to their existing additional equipment, but the heads-up display, filter manifold controls, hydration chamber, and oxygen release mechanisms had to provide the comfort, convenience, and control of an intuitive second skin.